As a top camping holiday destination, Spain has just about everything - sunshine, sandy beaches, gastronomy and top-class tourist attractions ranging from water parks to castles, palaces and delightful old town centres. If you love travelling and appreciate comfort, LUX-camp offers the highest standards of luxury camping site accommodation, with mobile home and luxury tent accommodation. We also provide other permanent luxury camping facilities including bungalow tent options. Why should I go camping in Spain? a southern European climate, with blue skies and warm spring and autumn periods. an excellent range of camp sites to choose from, with high star ratings. sandy beaches and shallow waters for young children. The fourth largest country in Europe and located on the Iberian Peninsula, Spain is bordered by France and Portugal. With ancient history and ancient settlers who arrived some 35,000 years ago, this popular destination is also very modern with well-planned tourist facilities and attractions. From sandy beaches, clear blue sea and coastal boat trips to snowy interior mountain ranges, there is always something to do and sights to see within easy reach of a LUX-camp site. Three of the most visited camping holiday regions of Spain are the Costa Brava and Costa Dorada on the Mediterranean coast, along with the Cantabria region in the north. This part of northeast Spain borders the beautiful Mediterranean Sea, with rocky coves and sand beaches from Roses to Tossa de Mar. Stretching from Girona to the French border, some areas have retained a traditional French look. 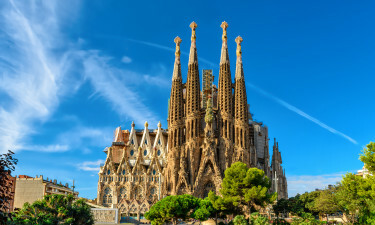 Points of interest include Catalonian wine exhibitions and cultural routes featuring the area’s famous painters, as well as boating, parachuting and water skiing, or excursions to the Pyrenees. 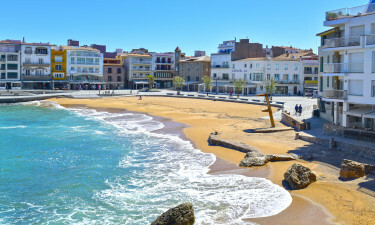 The Costa Dorada runs from the artistic and cosmopolitan town of Sitges in the north to Peñiscola in the south, with a fascinating medieval castle to explore. This golden coast has twenty towns and is over 200 kilometres long, boasting picture postcard views of rocky coves and wide sandy beaches (especially in the northern half), with clean sand and transparent sea. This region is in the north of Spain, with its mountains forming a rugged backdrop to the Cantabrian Sea. The peaks and forests including the Picos de Europa National Park are popular with hikers and mountaineers. Centred on Santander, a port city on the Bay of Biscay, the regional capital is known for its seafood meals and its long, curving beach with lighthouse. 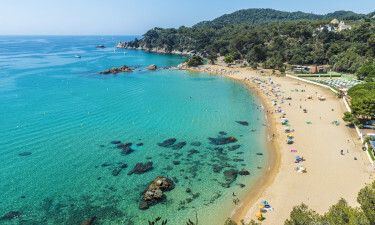 In the east, the Costa Brava and Dorada are famous for their golden and white beaches and rocky coves, bordering the beautiful Mediterranean Sea. These are complemented by tree-lined mountains and dramatic scenery. Some of the hidden coves just off the beaten track make exciting exploring with snorkelling equipment, while in good weather the chance to explore the scenery of the Ebro River Delta is also very inviting. There are woodlands and hiking routes to be discovered in the interior, as well as the Pyrenees and Cantabrian mountain ranges. bars. 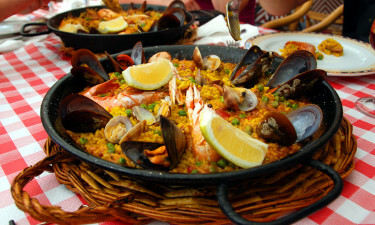 Several restaurants offer the lunchtime ‘Menu del Día’, typically from one to three o’clock and with choices including salads, croquettes, cured Serrano ham or paella, based on rice and meat or seafood. Near the coast, fresh seafood is particularly popular including octopus (‘pulpo’). Why not enjoy morning coffee in a local café, or a long lunch in one of the many local restaurants, accompanied by a glass of local red wine? In Cantabria, the immense Picos de Europa national park can be appreciated conveniently from the cable car station at Fuente De. In Catalonia, the regional capital of Barcelona is complemented by the city of Girona, with medieval streets and historical riches. Visit the Museum of Figueres, or a host of other collections, gardens and sea front walks. Port Aventura is one of Europe's best theme parks, with themed areas including the Far West, Mexico and China, as well as music and acrobatic shows – not forgetting the thrilling Dragon-Khan ride. Why not visit Spain fiesta or carnival time and join in the fun? The Spanish climate is generally mild and temperate with variable weather in winter. Warm periods in spring and autumn are accompanied by hot dry summers, with occasional heat waves - especially further southwards during July and August, where the holiday season tends to be longer. There is usually only moderate cold in the winters. May and September can see occasional thunderstorms, especially on the Costa Brava and Dorada. Spain saw the ancient Romans and Carthaginians fighting for territory, before the Arabs conquered parts of the south. Later, Catholic monarchs built a powerful empire, especially after the Americas were discovered. Foreign and civil wars over centuries saw the later independence of several Spanish colonies. After growing rapidly in the 1960s and early 1970s, the dictator General Franco died in 1975 and the country returned to constitutional monarchy and democracy, becoming a member of the Eurozone in 1999.